There's been loads of content written on this hot salmon fishing topic and from what I've personally witnessed 'most' of the normal hooking techniques will work some of the time. As a professional ghillie a 'some of the time' batting average is not high enough so in the next few paragraphs I'll give you an insight into what works for me over 90% of the time. On most salmon rivers in the Northern Hemisphere every salmon fisher usually has to work to a degree for the chance of sub-surface co-operation as salmon tend not to shoal up like mackerel on a 'feeding frenzy' suicide mission. With this in mind coupled with the varying degrees of difficulty & tactical skill required in placing your fly in front of a salmon that's willing to cooperate it is very important that you can convert these salmon fly investigations into salmon captures and not leave them as wasted opportunities. The absolute key here is to allow that salmon sufficient time to turn on the fly and never to react immediately you feel the first tap from the salmon's initial contact. If you're a trout fisher you'll be pre-programmed to immediately tighten and each year in Scotland thousands of salmon hooking opportunities are squandered by anglers who lack the knowledge or composure and react too quickly. If you're new to salmon fishing and doubt your own reactive instincts repeat the mantra 'do nothing' in your head over and over again while salmon fishing to re-align your pre-programming habit. If you do this though it may well have a negative impact of your fishing success the next time you go trout fishing! It's vital that you let your salmon turn on the fly but that doesn't always happen straight away and it's normal to experience 4 or 5 sharp tugs on the fly before the steady draw of fly line from your reel commences. You you must be patient and even when after several seconds of these tugs have lapsed you need to typically give the salmon another 6 seconds of steady consistent line draw before you need to then set the hook. The problem with these early 'do nothing' moments is that they will feel more like minutes and not seconds due to the instant adrenalin release they will trigger. When a salmon takes and turns on your salmon fly you are in the 'hands of the Gods' as to where the micro point of your fly's hook is positioned in the salmon's mouth. The majority of the inside of a salmon's mouth is tough tissue and not soft tissue. If your hook point is sitting lightly in the tougher tissue of the salmon's mouth when it turns logic will tell you that a fair amount of hook point pressure will be required to set that hook properly. If a salmon wants to get rid of a 'half set' salmon fly it is indeed a master at doing so and your contact with that fish is unlikely to last for more than a minute. When the time is right during the initial take after making sure the salmon has turned the most logical method of applying hook point pressure to the micro hold of the hook point in the salmon's mouth is to lock up your reel by clamping it and at the same time keeping the rod tip down and pointing in the direction of the fish. If you do this you will feel the weight of the salmon from its forward momentum which indicates sufficient hook point pressure to ensure a proper hook set. Please note than only a few seconds of feeling the weight of the fish is required before then releasing the reel and lifting the rod to play the fish. The salmon fishing books range from varying degrees of advice but the main one is not to react and let the salmon turn as I've already mentioned. The books then usually go onto say 'just lift into the fish'. If you do that the soft action of a fly rod coupled with a lightly set reel drag (which you have to fish with to allow the salmon to turn) will not exert enough hook point pressure to logically set the hook properly & effectively and especially so if the hook point is positioned in the tougher tissue inside the salmon's mouth. This hook setting method is best avoided unless you're already addicted to that awful gut wrenching feeling of loss from a slack line. 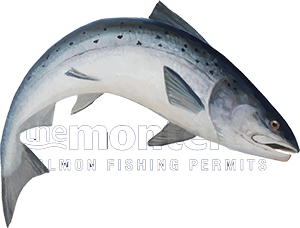 Most of the important skills involved in salmon fishing should make good logical sense and therefore easy to remember and put into practice. If you place a salmon fly hook point in the tough skin on the palm of your hand and have a colleague lift into the hook point at 25 yards with a slack clutch you will indeed be jagged but usually no more than that. Whatever you do don't ask your colleague to clamp the reel face with the rod tip down as you walk away with the fly hook in your palm unless the receptionist at your doctor's surgery is particularly hot!